(Front row L to R.) Hugh Utterback, Janice Lacivita Orlando, Geoff Utterback; (Back row L. to R.) Paul Utterback, Margi Utterback Hoover, Kurt Utterback. Theresa Utterback was widowed following the untimely death of her husband and, as a single parent, she raised a family of seven children. She worked in the food service department of the Alliance City School System for more than sixteen years, retiring in 1981. She was the housemother for Alpha Chi Omega on Mount Union University campus until her death in 1992. In 1985 she was made an honorary member of the Sorority. Theresa held education in the highest esteem. All of her children graduated from Alliance High School and four became college graduates. In recognition of her struggle as a single parent and the tremendous impact that she had on their lives, her children honored her memory with a scholarship to assist AHS students of today who are willing to work to help themselves. Her children include Janice Lacivita Orlando ’56, Judy Lacivita Sedoris ’58 (deceased), Geoffrey ’65, Hugh ’66, Paul '67, Kurt ’68, and Margi Utterback Hoover ’76. The initial endowment was $25,000 with $40,000 added over the next two and a half years. 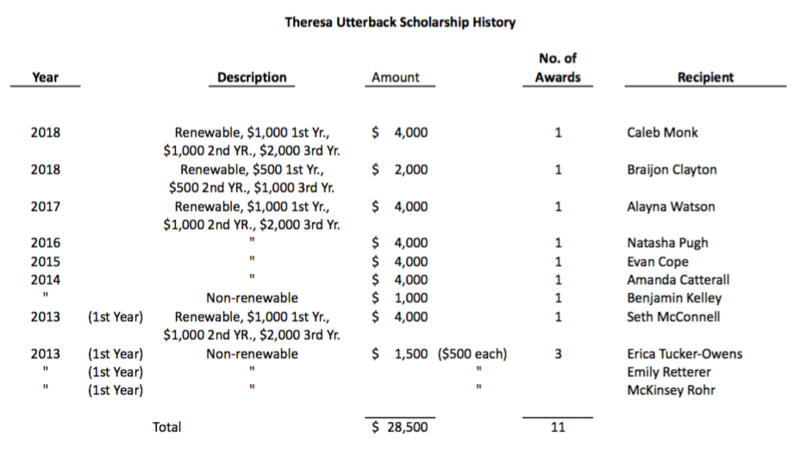 A renewable annual scholarship will total $4,000 with a distribution of $1,000 prior to the first year of college, $1,000 prior to the second year of college, $2,000 prior to the third year of college. While the principal grows, the family will provide additional donations to fund each year’s award(s). Additional non-renewable scholarships may be awarded as funds permit. Recipients will be selected by a committee established by the family with assistance from the AHS Foundation Scholarship Committee, as requested. In recognition of their mother’s efforts as a single parent for much of their lives, her children have determined that priority for recipients shall be given to single parent households.